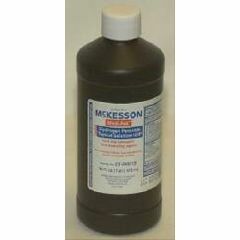 Medi-Pak™ Hydrogen Peroxide Topical Solution USP (3%). First aid antiseptic to help prevent the risk of infection in minor cuts, scrapes, and burns. Oral debriding agent aids in the removal of phlegm, mucus, or other secretions associated with occasional sore mouth. Latex-Free. clean wound . mouth wash.
over 60 woman. business owner. single. Good to use to clean a wound without burning. If used in the mouth to clean sore you do not swallow but it does leave a little yuk taste. When the peroxide and vinegar are in its own spray bottles, I use them simulatniously for cleaning and disinfecting...from rinsing, to wiping counters. Does this product contain any other ingredients other than hydrogen peroxide?